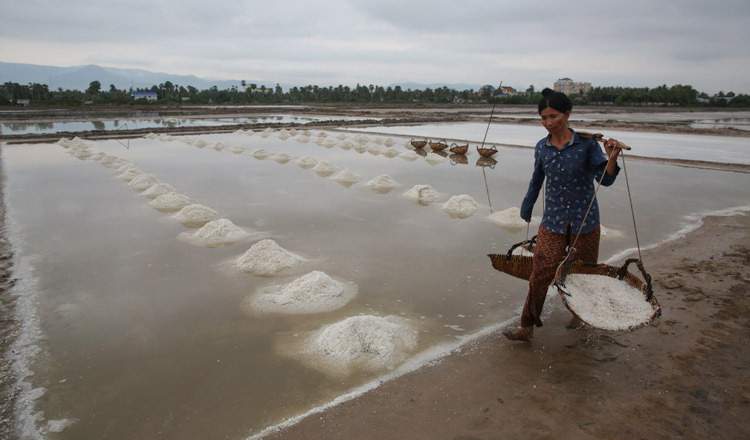 Bun Baraing, vice president of the Kampot-Kep Salt Association, told Khmer Times that salt farmers are back in the field after a spell of sunny weather. If the weather holds up, the association will produce about 100,000 tonnes of salt this year, he added. “If the weather stays like this until May or June, we expect to produce 100,000 tonnes of salt,” he said. Mr Baraing said this presents a stark contrast with last year, when heavy rains kept farmers away from work, forcing the Kampot-Kep Association to sign a deal with China to import 30,000 tonnes of salt to meet domestic demand. Last month, Cambodia received 10,000 tonnes of salt from China, which have already been distributed to suppliers in the local market, he said. Each tonne of Chinese salt cost the association $135, but fetched just $100 in the local market, Mr Baraing lamented. By contrast, locally produced salt sells for about $120, he explained. Remaining shipments of Chinese salt – equalling 20,000 tonnes – have been put on hold as farmers in Cambodia resume production, Mr Baraing explained. He said the sector is now dealing with a labour shortage, with the traditional workforce moving away from rural areas to work in factories or migrating to Thailand to increase their earnings. Mr Baraing said the association is urging the government to support the development of new methods of salt production, such as mining, calling on authorities to dispatch experts on mining and salt to work together with the association. “I have already sent a request to the Ministry of Industry and Handicraft on this issue. We have not received a response yet,” Mr Baraing said. When asked by Khmer Times, Oum Sotha, spokesperson at the Ministry of Industry and Handicraft, said Cambodia has no plans to implement alternative methods for salt production. He said the current method – based on pumping seawater to rice fields and letting the water evaporate – is effective enough. “We told them it is important to build up and strengthen their association to get support from the government,” Mr Sotha said, adding that the ministry was now preparing a request to renew the VAT exemption on salt production. The local market currently demands between 80,000 and 100,000 tonnes of salt a year. A sack of 50 kilograms of salt now fetches 18,000 riel ($4.5) in the local market, according to the association. There are 4,657 hectares of land used for harvesting the commodity in Cambodia and 200 farmers working on them. 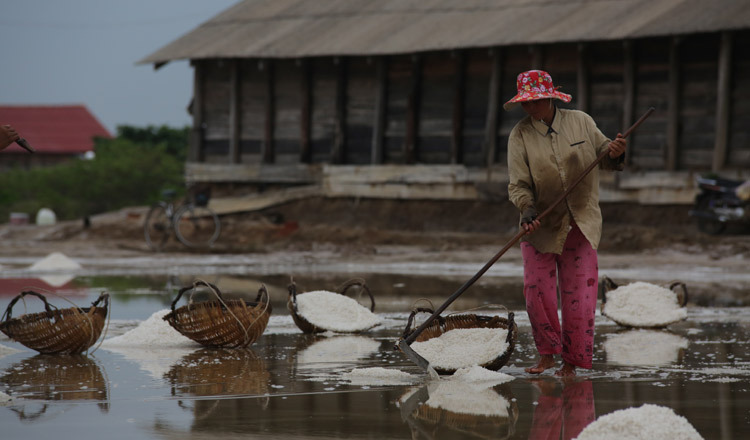 Salt is farmed mostly in the provinces of Kep and Kampot. The government issued a directive last month urging farmers to plant and harvest rice only one time during the dry season this year due to upcoming shortages of water and excessive rice planting in 2018. The directive was issued after Water Resources Minister Lim Kean Hor told Prime Minister Hun Sen that farmers in some provinces had excessively planted and harvested rice, causing an imbalance in the overall production of goods. In the directive, Mr Hun Sen said El Nino will cause unusual weather patterns in Cambodia, including temperatures going as high as 42 degrees Celsius with little chance of rain in April and May.